this member to the rear. The mechanism is devised so that the sliding member will unlock the bolt after a sufficient delay to permit the projectile to clear the muzzle. Still another method, known as the "booster principle", uses a device at the muzzle to trap the muzzle blast. 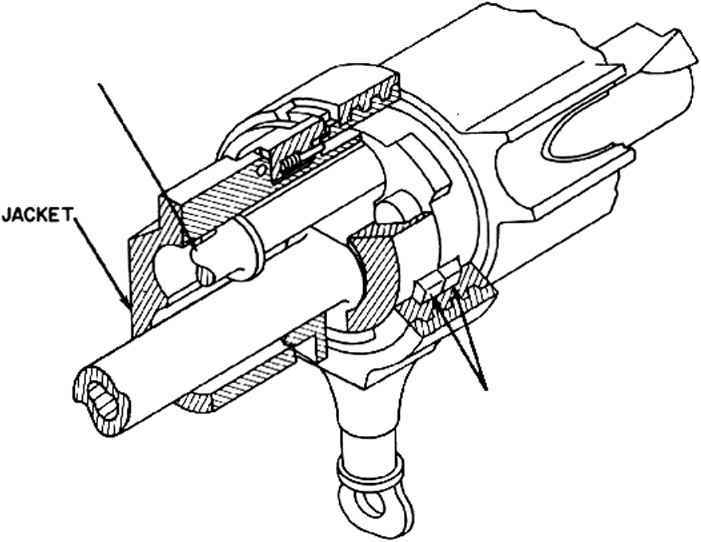 The muzzle device is moved by the expanding gases and this movement is transferred to the breech mechanism through a mechanical connection which unlocks the bolt. After unlocking occurs, the trapped gas pressure blows back the bolt. The basic point to remember is that a delayed blowback gun is one in which the bolt remains loeked until after the projectile leaves the muzzle and is then unlocked so that the residual pressure can blow the bolt back. Whether the delayed unlocking is accomplished through recoil actuation, gas actuation, setback of the primer, booster actuation, or any other method is not of critical importance in considering what effects the delay has on the blow-back action. Accordingly, in the following description and analysis of delayed blowback, it should be understood that, although recoil actuation is used to illustrate the principles, these principles apply regardless of what method of actuation is employed. The cycle starts with a cartridge in the chamber and with the bolt locked (fig. 1-30A). When the gun is fired, the reaction to the forward momentum imparted to the projectile and powder gases causes the barrel and locked bolt to recoil together. This recoil movement continues for a short distance until the projectile lias cleared the muzzle and the bolt unlocking device is actuated (fig. 1-30B). When the bolt is unlocked, the residual pressure drives the cartridge case to the rear against the resistance offered by the inertia of the bolt. After unlocking occurs, the barrel is stopped by a buffer and returned to battery by the barrel spring. When the residual pressure has dropped to zero, the bolt continues to move to the rear of its own momentum (fig. 1-30C). As the bolt moves back, the spent cartridge case is extracted and ejected and the bolt driving spring is compressed. When the driving spring and buffer system has absorbed all of the kinetic energy in the bolt and brought the bolt to a stop, the energy stored in the spring drives the bolt forward. The bolt picks up a fresh cartridge from the feeder as it moves forward, loads this cartridge in the chamber, and then relocks to the barrel, thus completing the cycle of operation. In a delayed blowback gun, the blowback action occurs under the relatively low residual pressure which exists after the projectile has left the muzzle and therefore case separation does not present a serious problem. However, it should be realized that the residual pressure can be considered to be relatively "low" only when it is compared with the peak chamber pressure. In a typical 20-mm gun with a barrel length of nearly 60 inches, the initial value of the residual pressure is approximately 5000 pounds per square inch and this pressure may be considered to decrease exponentially with time as shown in fig. 1-31, until it rcachcs zero approximately 0.008 second after ignition of the propcllant charge. Pressures of the magnitudes which exist for the major portion of the time shown in the figure arc great enough to cause rupture of the thin walls near the base of the ease if the case is permitted to move too far out of the chamber while these pressures are acting. Therefore, it is necessary in a delayed blow-back gun to limit the bolt movement so that the cartridge ease docs not move too quic kly out of the chamber.